Your fans or how to save the most important information about your soul mate. During chatting you will always find a man with whom you will want to chat more and more. You will find out a bulk of new personal information about him: his mindset, his biography, what he likes, hobbies, children, positive or tragic moments of his life. But what to do if it is not yet a love and there are several men you want to chat with. How to invite them to a chat? How to save the most important information about them? It is very easy with ChatOS! The average time of chat – you can specifyaveragetime duration of your chats with men that you can calculate due to the formula of average number. If the duration of all chats is important for you, thus this parameter is for you but if you do not need it, just clear a tick box. The duration of the 1st chat. The maximum duration of any chat with a man is in minutes. This parameter can become particularly useful within the first chat. If a chat lasts pretty long, maybe you have found a common language and he must be added to the admirers list by the system, or mustn’t he? But if it is not important, just turn off this parameter by clearing a tick box. The number of chats. The total number of chats. The total number of chats spent with a man. Of course, you may not know a man good enough, thus set a number of chats what you want to spend with a man to get him a chance to become your admirer, but if it is not so – just clear the tick box. 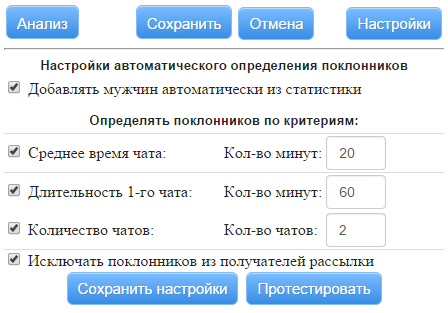 To check the accuracy of your settings just click on “Test”. After that you will see a list of men what can add by themselves to your list of admirers. Adjust the settings and check them with a help of this functional. After you finish, just click on the button “Save settings” and those men will be automatically added to the list of your admirers. This is one of the most difficult tools of this system; we offer you the second variant of adding a man to the list of admirers. Click on the profile picture of a man in the right panel over your contacts. Submit that you really want to add this man to a list of admirers. That’s it. After that the man will be added to the list of fans. What is the issue of it? Your notes and comments are also available for you on a profile of man. 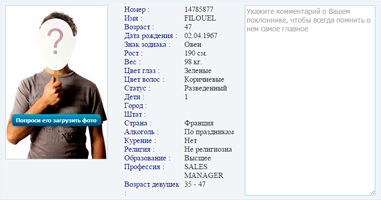 Set automatic characteristics for a search of fans in your statistics.